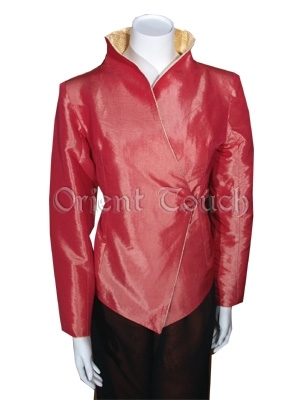 This chic jacket integrates traditional Chinese design with a beautiful western style. Made of iridescent Thai silk, the jacket changes colors if you view it from different angles. Patched with bright yellow colored brocade inside collar and sleeves, it looks extremely charming. It features wrap-style with one art frog fastening. Great for everyday wear.